Vertigo releases from New Zealand are somewhat puzzling. The first few releases of the British counterparts were on Fontana. Colosseum's Valentyne Suite was for instance released as Fontana VTY 847900. A lot of the later British albums were released on Vertigo here too, but much of the elaborate packaging was lost, a prime example being 6360 043, Tudor Lodge's self titled LP. The complex gimmix cover and texture was completely discarded and rendered into a ''normal'' single cover (with flipback). 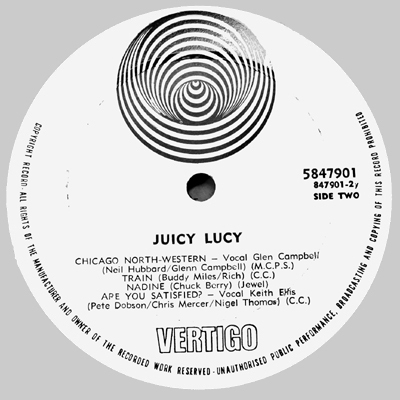 Another example is 6360 014, Juicy Lucy's Lie Back And Enjoy It, which lost its poster cover, but got at least a fold-out cover with the portraits allocated to the back cover. Otherwise none of these releases seem interestingly different enough to be included here. If gatefold covers were applied, they were ''New Zealand style'', with the opening at the inside of the sleeve. There were, however, some very unexpected releases too, that are unique to this country. One native singer was signed, one German album was released and some LP's were licensed from Island (even though there are albums on Island in New Zealand too). In the singles department this branch may have had some more freedom and the native singles we could get hold of are on display at the bottom, as usual. New Zealand albums have B-side styled labels on both sides (see scans below). The font of the perimeter text on the label is characteristic enough to identify a record as manufactured in New Zealand. Matrix numbers can be both machine-stamped and hand-etched. There is no mentioning of the country of origin on the label to be found. There is a notice, however, on the cover either with a logo (see scan) or else just in print. We present the albums in numerical order. The Vertigo logo on front is red. The musical contents are identical to the UK release. Another variation on the theme of Eve, this time she is definitely female. On the back of the sleeves she even has the nerve to pose without knickers! Quite different from, say, the Spanish release! Apart from the different catalogue number, the differences with the UK release are inconsequential. Surprise, surprise! 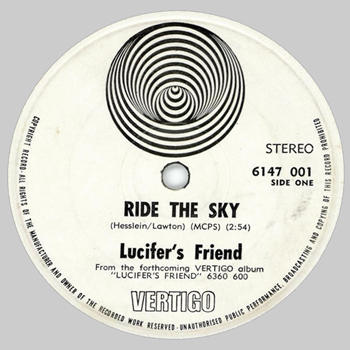 Even the first Lucifer's Friend album is available on Vertigo swirl, complete with German catalogue number. Only in New Zealand, though! Line-up: Carsten Bohn, dr/ Jean-Jacques Kravetz, keyb, sax/ Inga Rumpf, voc, gtr/ Karl-Heinz Schott, bsgtr. Recorded at Phonogram Studios, Netherlands. Track listing A-side: Life Without Pain (Inga Rumpf + R.Coules) 3'45''/ Rosalie Part I (Inga Rumpf) 5'54''/ Otium (Jean-Jeaques Kravetz) 4'23''/ Rosalie Part II (Inga Rumpf) 4'10''/ Indian Rope Man (Ritchie Havens) 3'17''. 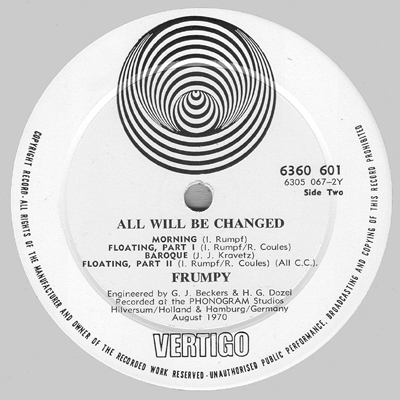 Track listing B-side: Morning (Inga Rumpf) 3'20''/ Floating Part I (Inga Rumpf + R.Coules) 7'33''/ Baroque (Jean-Jeaques Kravetz) 7'33''/ Floating Part II (Inga Rumpf + R.Coules) 1'23''. 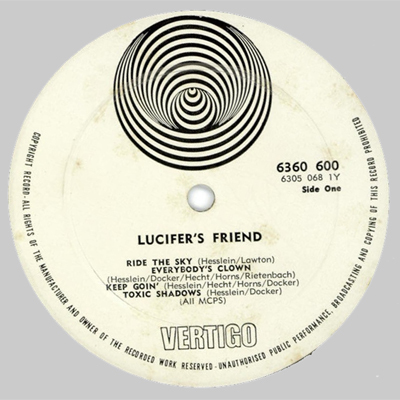 The Vertigo logo on front is yellow. These are German matrix numbers in a German font, including that country's code, 320. They are machine-stamped. First album of this band, that struggles on this release with rather disparate interests and has difficulty to blend them into a meaningful musical unity. The single Life without pain tries to be commercial soul-rock, expertly executed but very predictable. The bluesy ballad Rosalie is monotonous and bleak, but almost saved by the great vocal performance of Rumpf. Otium raises a hectic atmosphere with flashy organ riffs, while the Ritchie Havens cover Indian rope man sounds competent, but not very exciting. Side B is completely different. Morning adds carloads of percussion but fails to swing anyway. Floating is suddenly quite experimental, especially the organ parts, and even incorporates a reasonably palatable drumsolo. Baroque makes use of strongly dissonant progressions at first, but ends on a doubtful beefed-up note. Still a long way to go, the album at least attempts at a sound of its own. There are no electric guitars on the record! The inventive op-art gimmix sleeve that was fitted over the cover proper (in Germany, that is) has been discarded. Instead, just the gatefold cover survived, which is nice enough in itself and needs no comment. Inside the gatefold the black and white wave-lines are difficult to appreciate without the gimmix outer sleeve. The lettering nicely evokes a ''reptilian'' impression, very fitting and properly placed too. Notes: This was released in Germany on Philips (6305 067, which is also the matrix for the NZ issue) in 1970. Line-up: Ricky Ball, dr/ Barry Coburn, sax, keyb, xyl/ Miles Golding, vl/ Eddie Hansen, gtr/ Robert Hooper-Smith, keyb/ Bruce Lynch, cb/ Peter Madill, cl/ Lindsay Marks, voc, gtr, trp/ Leone Toms, fl/ Philip Toms, gtr/ Paul Woolwright, bsgtr. Production: Barry Coburn + Robert Raymond. Cover-art by Warren Wilson (backcover). Recorded at Stebbing Studios, Auckland. Track listing A-side: Son Of The Sun/ One More Time/ Candy Words/ Sad Girl/ Manhunter/ Family. 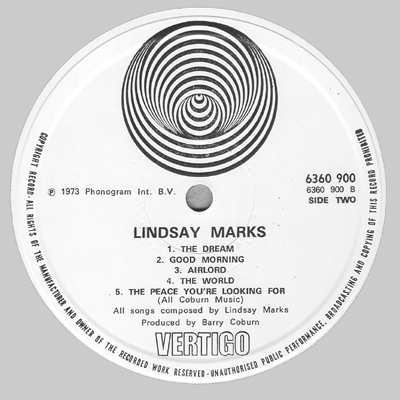 Track listing B-side: The Dream/ Good Morning/ Airlord/ The World/ The Peace You're Looking For. 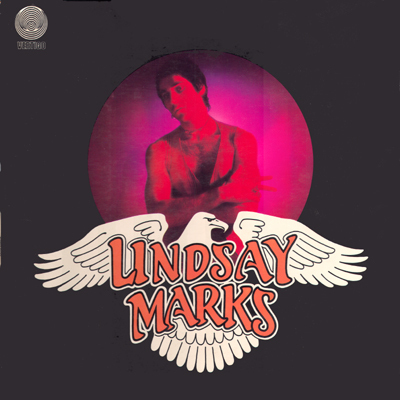 All tracks by Lindsay Marks. 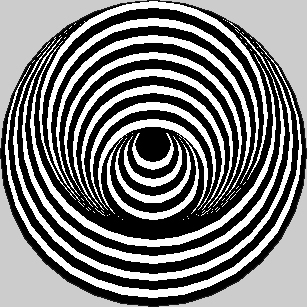 The Vertigo logo on front is white. There are no running time indications. The inhospitable mix of Jim Croce, Cat Stevens and Barry Ryan that adorns these sides would not interest anyone in 2007, I guess, but it is a very rare swirl record nonetheless. The backing band is nearly brilliant, though. Poetic flute parts, driving percussion. sparkling guitars, it's all there. But no amount of inspired backing can salvage anything worthwhile from these overly common songs that lack any feature that would elevate them above the mediocre. Only the beginning of the B-side is somewhat less barren. The dream even is a nice song (with a fabulous arrangement) and Airlord at least isn't downright discardable. Otherwise, give this a wide berth. The front cover is a great example of unprofessional graphical designing, but without the charm that such efforts can have. Heraldic eagle and soft-cell photograph are not integrated in any way, except through both being placed centered. The colours are grisly too. Luckily the backcover is a surrealistic pen-drawing of hordes of people who climb a gigantic eagle. Quite discomfiting. There is an insert with the (terrible) lyrics that is made of textured paper and that boasts scorchingly pink clouds as well. The lettering neither blends with the photo, nor agrees with the severe style of the heraldic animal. What a mess! Line-up: Robert Fripp, gtr/ Michael Giles, voc, dr/ Greg Lake, voc, bsgtr/ Ian McDonald, fl, ob, cl, keyb, vibr, voc. 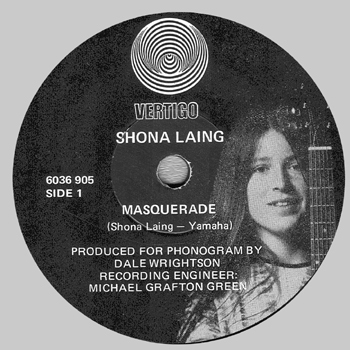 Recorded at Wessex Sound Studios, London. 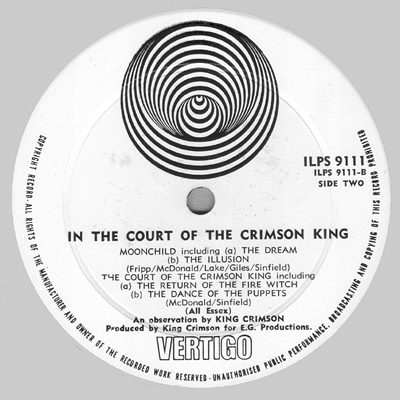 Track listing A-side: 21st Century Schizoid Man [including Mirrors] (King Crimson + Peter Sinfield) 6'52''/ I Talk To The Wind (Ian McDonald + Peter Sinfield) 5'40''/ Epitaph [including March For No Reason and Tomorrow And Tomorrow] (King Crimson + Pete Sinfield) 8'30'' . 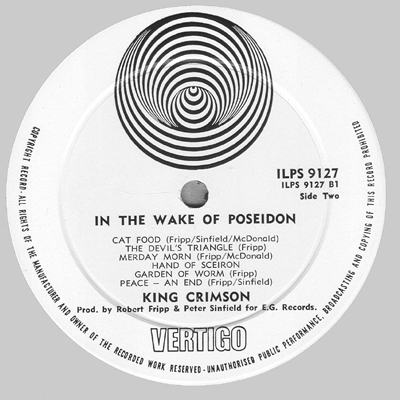 Track listing B-side: Moonchild [Including The Dream and The Illusion] (King Crimson + Pete Sinfield) 12'09''/ The Court Of The Crimson King [including The Return Of The Fire Witch and The Dance Of The Puppets] (Ian McDonald + Peter Sinfield) 8'48''. The Vertigo logo on front is black. After relistening to the predecessor band Giles, Giles & Fripp with its uneasy mixture of Bonzo Dog Band antics and finely honed 60's guitar pop, it is ever so enigmatic how this here album could have emerged from the ashes of that particular band. ''Court'' is one of very few genre-defining records. In fact the album sets standards for ''prog-rock'' that are not easy to equal, even less so to surpass. Issued in 1969 (!) in the UK, there is so much that is really new here that any concise listing (like this one) of those features must fail to do justice to the music. Extreme dynamic differences between blatantly loud and whisperingly quiet are introduced in rock for the first time here and to great effect. Technically the record is brilliantly played, but not one single time is this detrimental to the music's expressivity. Later prog bands often sinned against this. 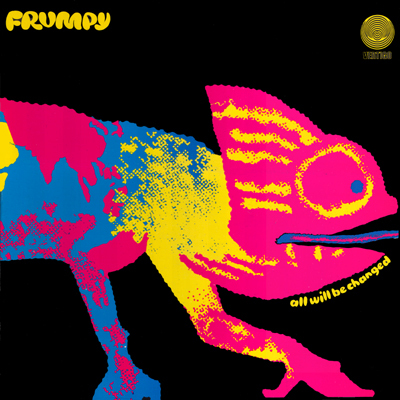 The guitar of Fripp is recognizable out of millions: an integration of dishearteningly fast and dissonant notes with passages suddenly long-sounding and fluent. Also the woodwinds are treated in a new way and establish a conglomerate of cold jazz (not cool! ), avant-garde and ''organized chaos'', as Fripp expresses himself. McDonald plays every note with feeling and confidence and also contributes the washes of mellotron that characterizes much of the sound. Lake sings sensitively and plays a fine and inventive bass-line, Giles is a drummer far above average in rock. The well-known opening blends hard-rock with lush mellotron and heavy woodwinds (really!) with a blazing guitar solo. Its unfriendly angularity and general threatening atmosphere notwithstanding it even seemed accessible enough to have been projected as a single (that never came out). Futuristic in its litteral meaning, this still sounds fresh and urgent in 2007. The contrast to the following I talk to the wind is stunning. Here is a peaceful oasis with a superb flute-part that soothes the soul and at the end blends into late-night jazz with excellent multi-part vocals. The long Epitaph starts deludingly placent, but soon turns out to be so only on the surface. Underneath an ominous menace is omnipresent. Knowledge is a deadly friend/ If no one sets the rules/ The fate of all mankind I see/ In the hands of fools. This textual example still rings true after almost 40 years. Side B starts with the picturesque Moonchild, a lesson in gossamer treatment of atmospheric elements. The second half almost comes to a complete standstill and trails off into near silence. The title track is a complex combination of all previous modules. Huge waves of mellotron, lyrical woodwinds, intimidating rhythms, unexpected compository built-ups with many layers and noble guitar-parts are just some of the feautures. The lyrics are cryptic, but very suggestive. This album may be considered as the flagship of early prog and still holds its ground as of today. It is to be admired, that the cover matches the sounds within. It's one of those rare images that stick to the brain even after viewing it only once. A human face, distorted by fear and anxiety looms large, its emotions too big to fit completely on the cover. Nose and mouth are wide open, revealing grottos that suggest other worlds within worlds. Folded open, the picture continues. Through the repetition of the cheek-bone the face extends into a landscape. The ear stands off into an azure cosmos where distant planets float along. Also the inside is memorable. A moon with a benign face and two sharp incisors makes a narrative gesture. Red planets orbit him everywhere. The very readable lyrics are printed in white lettering on the left of the gatefold. Top-notch. Only negative point: the colours have been very unfaithfully reproduced. There is no lettering to interfere with the image (but the Vertigo logo does, unfortunately). A very wise decision. Line-up: Mel Collins, fl, sax/ Robert Fripp, gtr, keyb/ Michael Giles, voc, dr/ Peter Giles, bsgtr/ Gordon Haskell, voc/ Keith Tippet, keyb. Production: Robert Fripp + Peter Sinfield. Cover-art by Tammo de Jongh (outside) + Peter Sinfield (inside). Track listing A-side: Peace - A Beginning (Robert Fripp + Peter Sinfield)/ Pictures Of A City [including 42nd At Treadmill] (Robert Fripp + Peter Sinfield)/ Cadence & Cascade (Robert Fripp + Peter Sinfield)/ In The Wake Of Poseidon [including Libra's Theme] (Robert Fripp + Peter Sinfield). Track listing B-side: Cat Food (Robert Fripp + Peter Sinfield + Ian McDonald)/ The Devil's Triangle (Robert Fripp)/ Merday Morn (Robert Fripp + Ian McDonald)/ Hand Of Sceiron (Robert Fripp)/ Peace - An End (Robert Fripp + Peter Sinfield). How to move on without Lake and McDonald, who both had a representative role in the sound of the debut LP? And how to follow up a record like the previous one musically? The answer is thought by many not to be wholly satisfactory, as this here album is often seen as a weak brother of the first. 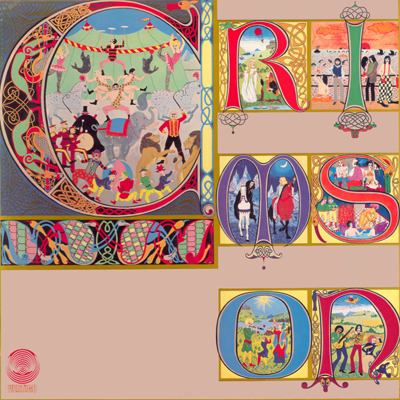 Fripp now plays the characteristic mellotron himself (without any discernable difficulty) and Collins is the new woodwinds miracle, not less enticing than McDonald was. The weak point must be the vocals. Haskell's voice is severely limited and does not always credit to the emotions that he is asked to express. It may be true, that no real new points of view are presented within this album, but they are definitely further developed to at times majestic results. The fragile start of Peace - a beginning contrasts again heavily with Pictures of a city, where the menace now has become apocalyptic. The middle piece of that track is so transparant, that it is hardly music anymore: ethereal webs of sound that drift along. There are more complicated means necessary to achieve this ever expanding contrast. More asymmetrical time-signatures, more measure-changes, more complicated riffs, often played unisono to reinforce them. The tranquil Cadence & cascade shows the disadvantages of Haskell's wobbly voice very clearly. The overwhelming title track pulls all stops. Fripps solo on acoustic guitar is immediately recognizable and mellotron waves hurl their depths over your head as if they want to drown you. Maybe the lyrics are a shade too mystical for their own good. Side B starts off with the almost accessible Cat food, a bitter observation of consumer's paradise, adorned with the freakiest grand piano imaginable. Never need to worry/ With a tin of Hurri Curri, no indeed. The strongest track must be the three-part suite that follows, an exalted mixture of heavy rock, free-jazz and 20th century chamber-music with an exceptionally calamitous atmosphere. This track seems quite unsuitable to hear just before falling asleep. Cataclysmic shreds of music, sharp and incisive industrial soundscapes, shrieking dissonants, uncanny instrumental combinations and small morsels of innocent music that perish in the violence, these are hard ingredients to digest, but simultaneously very adventurous and uncommon listening. This is music that suggests the very end of times in a credible way, much like some episodes in the symphonies of Arthur Honegger do. More difficult to get acquainted with than the first album, nevertheless an excellent effort in its own right. ''Twelve archetypes'' inhabit the cover, painted with not too much skill, but with a reasonable amount of credulity to make up for this. The Vertigo logo is placed at the least disturbing spot, but still impeding the image's integrity. The texture of the British cover has been deleted, but the laminated surface has some vague kind of texture of its own. The inside shows the lyrics to the right and a colourful abstraction of blue and green. Again there is no lettering to interfere with the image, a fact we have heaped our praise upon already above. Line-up: Jon Anderson, voc/ Mike Charig, crnt/ Mel Collins, fl, sax/ Nick Evans, trb/ Robert Fripp, gtr, keyb, dr/ Gordon Haskell, voc, bsgtr/ Andy McCullogh, dr/ Robin Miller, ob/ Keith Tippet, keyb. 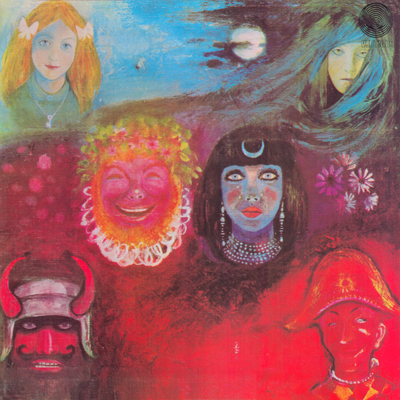 Track listing A-side: Cirkus [including Entry Of The Chameleons]/ Indoor Games/ Happy Family/ Lady Of The Dancing Water. All tracks by Robert Fripp + Peter Sinfield. These are machine-stamped. Perhaps ''700'' is a country code for New Zealand? The Giles brothers have left to join McDonald, but no big loss, as McCullogh is a worthy replacement at the skins and Haskell handles his bassguitar better than he does his own vocal chords. The enlarged woodwinds and brass sections seem to suggest jazz, and although this is true in some way, the results are thoroughly unexpected. This record was not received very well and it's easy to see why, though almost 40 years later these objections have largely evaporated. Undoubtedly this album is even less accessible than the previous one. The music now betrays psychiatric tendencies, as well as delusions of grandeur, but does so with verve and conviction. Grotesque subject matter reigns supreme. Already on Cirkus the amount of sudden harmonic eruptions and atmospheric twists borders on the insane. The lyrics evoke a dense nightmare like: Worship cried the clown, I am a TV. At the end of the track the music is abandoned for sheer chaos and destruction. Indoor games also balances precariously on the thin edge of the demented. Psychotic games are being played like: Each afternoon you train baboons to sing/ Or swim in purple perspex waterwings. Biting woodwinds, derailed guitars and large fans of mellotron are just (but only just) kept in control by the excellent composition. The macabre laughing of a deranged human being ends the track. In Happy family mental health does not improve. A row of totally flipped-out family members parades through the song, musically designed with again extreme means. The very short oasis Lady of the dancing water, with its truly miraculous flute part, is almost unlikely placid after all this mental violence. If only Haskell would have sung this a little more confidently. Side B presents a complicatedly structured suite, a model kit that tries to assemble very different elements into a unity. Jon Anderson of Yes sings the opening in his overclean style, but somehow fits very well in this evocation of times long lost, not in a historic sense, but more like the worlds of Tolkien do. Now Crimson suddenly plays crystal clear pop-rock with hints of things lurking underneath. This runs into The peacock's tale, a never heard before concoction of bolero, wistful oboe, mellotron hurricanes and extremely angular all-or-nothing jazz. Unique and inventive. 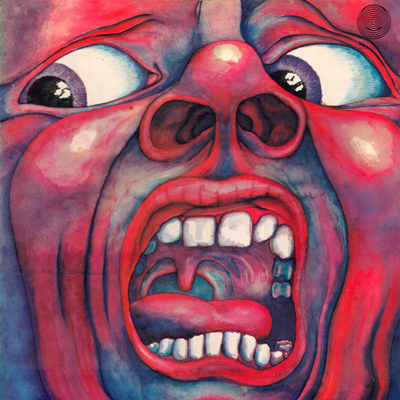 The battle of glass tears is again King Crimson as we know it: apocalyptic almost-chaos and a ruthless riff that induces panic. It discharges itself into a lonely crying electric guitar that sounds like the voice of the last living human, viewing utter destruction. Almost unbearable to really listen to. The very end is taken up by a frolicking waltz that makes a disheartening use of varispeed to produce another kind of nightmare: that of failing senses in front of a world in dissolution. One of the most extreme records to come out of rock country, it is easy to understand its chequered reputation, but the unflinching listener can dig up a lot of musical gold here. The cover follows more or less the Tolkien path: Celtic ornaments are combined with brightly coloured images that suggest legend and myth. By looking carefully, the beholder can distinguish scenes from the lyrics of almost all tracks. Some nice touches are being applied. Rock historicians may marvel at the ''N'', where a band consisting of Jimi Hendrix, Chris Wood and Ginger Baker is in full action. Unfortunately Hendrix plays right-handed! Above them Rupert flies along in a small aircraft. 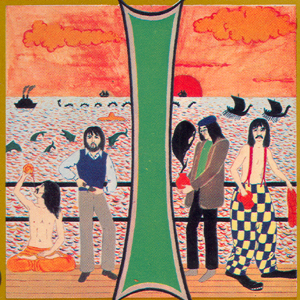 The ''I'' shows the Beatles aboard on a ship at a sea full of idiosyncrasies. George meditates, Paul poses worldly, John contemplates a ghost from a bottle that is Yoko and Ringo wears a clown's costume. The inside has unfortunately lost its colour. The lyrics are hardly readable on the now grey background. The Beatles' cameo appearance on the cover. The lettering is part of the image and the image is part of the lettering. Excellent. 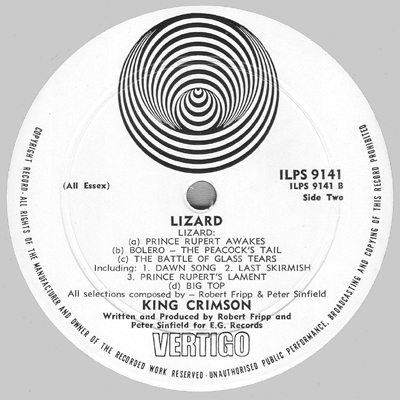 And just for the record: the collectible albums by Dragon have never been released with a swirl label. As you would expect, New Zealand released cassettes too. 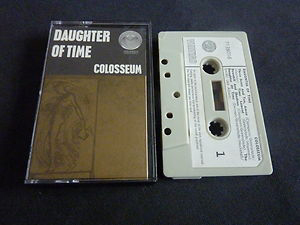 Below an example: Colosseum's Daughter Of Time. We couldn't find any better scan yet. A: For You. B: Split Ends. 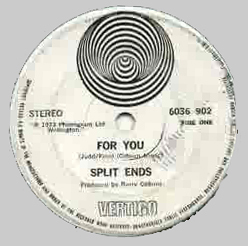 (extremely rare debut single, since this is also sought after by Split Enz and Crowded House collectors) and sorry about the horrible scan, the best we could get , unfortunately. A: Show Your Love. B: Don't Expect Me To Be Your Friend. A: Time is tight. B: ?. A: Masquerade. B: If You Could Read My Mind. (issued with special picture label, see scan). A: Someone To Be With. B: Lady Dipton. A: Education. B: Swell foot Sue. A: This flight tonight. B: Called her name. A: Ride the sky. B: Horla. We sincerely hope that you will be of assistance in making this information as reliable as possible. In case of any contributions or questions or even complaints, please use this here virtual address: e-mail.